Winner Dr. Toy 10 Best Audio/Video CD/DVDs for 2009! Winner 2010 Family Choice Award! Winner of 2010 Mom's Choice Gold Award! Winner 2009 National Parenting Publications GOLD Award! Winner 2009 Parents' Choice Recommended Award! Winner of the Film Advisory Board 2009 Award of Excellence! iParenting Media Award "2009 Best Products" Winner! Winner of the 2009 Creative Child Seal of Excellence Award! Awarded the 2009 Dove Foundation "Family-Approved" Seal! AMERICAN HEROES #3, by Jonathan Sprout, Sprout Recordings, ages 7-12. "Teachers and parents often ask children to name someone they would consider a hero. Television reporters often cite public servants who have gone above and beyond the call of duty to help fellow citizens. And on Jan. 15, the world witnessed the heroic work of Captain Chesley "Sully" Sullenberger, who saved countless lives as he masterfully piloted his crippled US Airways airplane into the Hudson River. But too often children think of celebrities as their heroes. As parents and teachers, we need to help children differentiate between stardom and heroism. We look up to celebrities for their talent. Heroes we look up to because of their deeds. Jonathan Sprout has made it his mission to educate children about some of America’s heroes. Sprout has just released the third CD in his American Heroes series, another collection of awe-inspiring songs designed to inspire children. Sprout follows the same format for "American Heroes #3" as he did on his critically acclaimed projects, "American Heroes" and "More American Heroes." Once again Sprout collaborated with Dave Kinnoin (another outstanding children’s songwriter and musician). Once again they crafted a collection of exceptional songs that spotlight such outstanding Americans as Jane Addams (Nobel Peace Prize), Elizabeth Blackwell (first U.S. female doctor), George Washington Carver (agricultural scientist), Cesar Chavez (civil rights activist), Milton Hershey (chocolate king/philanthropist), Thomas Jefferson (third president), John Muir (conservationist), Pocahontas (peacemaker), Wilma Rudolph (Olympic gold medalist) and Jonas Salk (polio vaccine). You know some of their stories of pain and struggle, heartache and perseverance. But these musical biographies are also filled with the power of imagination, selfless acts and remind us of the courage it takes to be true to your heart and passionately follow your dreams. I have written many times about what separates good children’s music from great children’s music. It is in the subtle and often-unseen musical artistry present in a well-crafted project. "American Heroes #3" is another fine example. Take the first song, "Chocolate King," for example. "Believe and never stop/Keep your eyes on the mountaintop. /A little bump in the road doesn’t mean a thing/To the Chocolate King." Pretty simple and even somewhat clichéd, right? But the magic comes when Sprout links the lyrics with a melody and accompaniment that support and propel the song into rock anthem status. This song reminds me of the old Fleetwood Mac song, "Don’t Stop Thinking About Tomorrow." Each song is a self-contained lesson that soars well beyond what we might think "educational" music for children might be. Again, the reason is Sprout makes these stories come to life by judiciously and strategically using the magic of melody and the power of brilliant musical arrangements to support each song. You will also appreciate the fact that the liner notes contain an informative summary about each American hero. In addition to all of the fabulous musical biographies contained in "American Heroes #3," there are two "bonus" songs. My favorite, "Good For Me," could be interpreted from several points of view (child to parent, citizen to hero), but I see the song as a soundtrack to a teacher’s end-of-the-year slide show about her class. Here’s the chorus: "It’s good for me that I found you/To be that special someone I can look up to/You’re with me now, and you’ll always be/Yes, you’ll always be good for me." This powerful song is a perfect culminating sentiment for such a magnificent collection of songs about individuals who started out as regular people and ended up as heroes. I would be remiss if I didn’t remind you to buy Sprout’s first two CDs, "American Heroes" and "More American Heroes." Be sure to go to his web site for more information. Look for the link to CD Baby where you can hear 30-second clips of each song. And remember, you too can be a hero to a kid!" **American Heroes #3. CD. 44:27 min. Prod. by Sprout Recordings. Dist. by CDBaby.com. 2009. ISBN 0-9677954-2-7. $12.99. 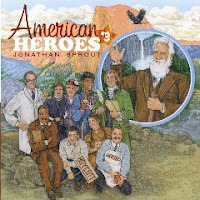 "Gr 1-5–Award-winning singer-songwriter Jonathan Sprout is back with his third collection of fun, inspirational songs about American heroes. Using a variety of musical styles on this Grammy Award nominated album, he honors the legacies of Jane Addams, Elizabeth Blackwell, George Washington Carver, Cesar Chavez, Milton Hershey, Thomas Jefferson, John Muir, Pocahontas, Wilma Rudolph, and Jonas Salk. Some of the songs are very straightforward in their focus, while others are slightly more obscure. All, however, have terrific melodies, are eminently singable, and contain important lessons children need to learn about perseverance, having a dream, standing up for what is right, and caring for others. Even the instrumental piece “Compassion” evokes strong feelings of warmth and love. “Doctor” (Elizabeth Blackwell) is particularly delightful and inspiring. The steady beat of running feet can almost be felt in Rudolph’s homage, “Can’t Stop Running.” The song celebrating the life and work of Cesar Chavez, “Si Se Puede,” will find a happy home in most music teachers’ repertoires. The quality of both the singing and songwriting is excellent, and all the songs are great musical tie-in to classroom lessons on real-life heroes as well as character education units.– Teresa Bateman, Brigadoon Elementary School, Federal Way, WA"
"Delightfully inspiring songs ... The arrangement and lyrics of songs like "What He Wrote," "Pocahontas" and "Si Se Puede!" are uniquely strong and enhanced by beautiful melodic voices that resonate enthusiasm, entertain and capture our imagination. What makes "American Heroes #3" exceptional is the lyrics that celebrate extraordinary people. The wonderful tempo and lyrics of "Good For Me' is poignant. It reaches the very heart of believing you can be the hero of your dreams. (The CD is) full of wonderful tunes about great people who inspire children and the child in all of us ... Delightful ... Fascinating..."
Janet Stokes, Chief Executive, Film Advisory Board, Inc.
Jonathan Sprout sings catchy original folk-style tunes that tell the stories of some of our nation’s heroes. Here he gives tribute to Thomas Jefferson, George Washington Carver, John Muir, and more. Sprout Recordings, $14. Ages 8 and up. "Share this remarkable musical series with teachers you know." Kathy O’Connell is a contributing writer to MetroKids and host of the Peabody-award-winning Kids Corner, weekdays 7-8pm onWXPN 88.5 FM. "He catches the essence of each person's challenges, inspirations and triumphs in bright lyrics and melody. The urge to sing along is irresistible. Sprout proves that music for children can be fun, educational and well produced, and the many awards he has earned for this series affirm his vision." It is always great fun to listen, watch or read something that your children enjoy and so do you. You know it is a struggle to listen to Itsy Bitsy Spider 30 times in one car ride (Thank God we are past that stage)! The twins and I received American Heroes #3 by Jonathan Sprout. We had a fantastic listening and learning from the CD. Check out a sample of the sound tracks below. My personal favorite was the Chocolate King which tells the story Milton Hershey. The twins, of course, fell in love with Pocahontas (which we listened to about 10 times in a row), lol. I was not sure how the girls would react to the part story-part song style of American Heroes #3. Overall it went very well. Initially they wanted to just scroll through the tracks until till we reached Pocahontas. After urging them a bit…they started listening to the entire CD. They started asking questions about the songs and characters. Which was educational for me as well…as I didn’t know the answers to some question and had to research it a bit. All worth it as it is great to see their little minds open up and their willingness to learn. Great for home school, book report prompts and open discussion on historical figures. 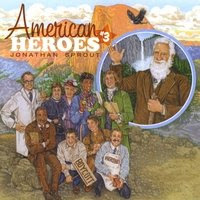 With catchy, up-tempo beats and learning-lyrics, American Heroes #3 by Jonathan Sprout is a must have for any family. This CD makes learning American History fun, plus how many history lessons can you dance to? I found myself bopping to the beat and the chorus lyrics sticking with me long after the music stopped – my favourite is Peanut Man it’s silly, fun, and true! I had a blast reviewing this CD and you’re kids are sure to love it too. Jonathan Sprout and his crew of talented muscians and singers brings history to life in a whole new way. In addition to great educational songs, this CD also comes with the lyrics and a quote from each person of history the song is written about. This is a wonderful learning tool for any age of child – start them young. They’ll love the rockin’ tunes and be learning all at the same time. And unlike other kids’s CD’s this one won’t drive you crazy. Any American History teacher would do well to have the three current volumes of American Heroes CDs. ... Jonathan Sprout's music has the thoughtful and narrative quality of a Broadway musical. ... great educational merit to go with enjoyable, evocative music. "Jonathan Sprout does a fantastic job talking about the lives of these American Heroes in a way that children can understand and get excited about, without talking down to kids." NAPPA and Parents' Choice award-winning artist Jonathan Sprout’s latest release American Heroes #3 is, as one would presume, full of songs about American…um…heroes. Though I’m solidly Canadian, we actually learn a decent amount of American history up here. (In our igloo schools). (This) is packed with fun & upbeat songs about some of America’s finest. Like Pocahontas - I learned a lot listening to this CD. Music and a history lesson all rolled into one makes for kids who actually remember the content after the test. This would be great in a classroom! It’s not all serious though. Tunes like “Chocolate King” about Milton Hershey offer up some education and an equally large dose of entertainment. The songs all have great hooks that reel kids in & make the lyrics memorable. Think we can convince him to come north for a while and make one for us Canucks? "Take a touch of John Mayer and add a little early Springsteen, Bon Jovi, Arlo Guthrie, and um, The Muppets? This is an unusual sort of history lesson, as palatable as Hershey’s kisses, and as memorable as any pop song. In American Heroes Jonathan Sprout sings about great Americans, celebrating the characteristics and qualities that make them special. The third CD in the series isn’t only a CD about history, although it makes a great basis or supporting material for a lesson. It isn’t only a CD about the spirit of compassion, empowerment, aspiration, and honor, although it does indeed celebrate those things. It’s also a CD of damn good music: catchy, slick, memorable, and progressive. I can think of many reasons to get this CD, but the main one is that it’s good listening. Kids will love dancing and singing along, and they won’t even notice that they’re learning about Milton Hershey, John Muir, Elizabeth Blackwell, Jonas Salk, Jane Addams, George Washington Carver, Wilma Rudolph, Thomas Jefferson, Pocahontas, and Cesar Chavez. They won’t notice that they’re learning about the kinds of qualities that might lead to all sorts of heroism and positive empowerment. Parents won’t mind a bit either. There are great harmonies, good riffs, and a welter of good music, including guitar, piano, keyboards, drums, mandocello, trumpet, saxophone, euphonium, flute, tuba, clarinet, accordion, and harmonica. Younger children will love how cool and grown up it sounds and will get into the catchy beats, dancing along (it’s easy to keep the beat with a tambourine if you want them to join in). Older children can read about each of the heroes on the CD, and can take inspiration from their lives, using the songs as a basis for further research and discussion, or just enjoy the cool music which is funky enough to appeal even to teens. Parents will appreciate that the lyrics are positive – no small thing in this world where so many teen oriented songs are dour and miserable, or overly suggestive. Instead this is music to inspire and celebrate without ever condescending or becoming cute. While some of the historical figures like Pocahontas, Jonas Salk and Thomas Jefferson are well known, others like Milton Hershey, John Muir, or Jane Addams will probably be new for many children. This is an exciting CD full of interest and fun. That it will continue to inspire our historically bereft children to look to history for all sorts of lessons about ourselves, and to see it as something dynamic, fun and relevant, is cause for celebration." "This CD includes lively songs about some of America's finest historical figures! ... An excellent learning tool in (the) classroom. What a great way to make learning FUN!" "... a great job with the instrumentation of each song ... this album is very easy for adults to listen to ... would make history class a lot more fun and memorable for kids!" Jonathan Sprout delivers another rich punchy packet of diversified heroes with his latest CD American Heroes # 3 - including Wilma Rudolph, George Washington Carver, Cesar Chavez, John Muir and Pocahontas to name just a few. The songs are hip and happening - finely produced and performed tributes to some brilliant folks who have left a strong imprint on our society. Jonathan Sprout's music is infectious. His hooks memorable and singable. This collection of songs about inspirational Americans is educational and moving. I learned something about those I recognized, and was moved by the stories of those I'd never heard of. The variety of styles keeps the whole album interesting. Every song has a different character. I recommend it highly for young and old alike! Jonathan Sprout takes his music and makes it educational with a rock and roll beat!... This CD is more than just kids music, it is educational music that tells the story of some very important people.... Jonathan finds a way to make the words and music flow while truly telling the story so that children can recall the important facts! ... What a great way to learn about the past! Parents will enjoy the fact that this music is easy to listen to! Jonathan Sprout has a nice, smooth voice and uses several different instruments and styles to help capture the emotion and importance of what our American Heroes accomplished! ... These (songs) would be great for parents to help get their kids a jump start for loving history! This CD was a true labor of love and it shows on every song! and inspire not only young people but their parents and teachers as well. This CD is a must in every classroom and home! "Hip and fun songs and lyrics." As a first grade teacher, I am always looking for ways to make learning fun. Jonathan has helped me do that! All year long, we add the dimension of his music (and often dancing!) to reading, writing, and viewing stories of American heroes. He has performed several concerts at our school, and inspired my young students to learn more about the heroes in his songs, as well as want to learn about other people who are heroes. I know how much work lies behind each song, and how much research goes into the stories he tells about these true heroes. My students all have their favorite songs, which we play and sing along with over and over again. The 'Good For Me' song is so touching - and I love the 'Compassion' song at the end - I play it when I want the class to calm down and relax. I followed the making of this CD from its beginning, and I feel privileged to have had a glimpse into the production of such a worthwhile, educational, heartfelt project! It makes me appreciate his music even more than I already did! The three Heroes CDs are a must for every elementary classroom! Jonathan Sprout has done an outstanding job with his new Heroes 3 CD. As an elementary music teacher and as a parent of a fourth grader, my students and I have enjoyed Heroes 1 and 2 in class and at home. We were so excited when Heroes 3 was complete and we were not disappointed! Jonathan has such a wonderful way of capturing the spirit and the life of these amazing people from American history in his songs. The beautiful melodies, engaging harmonies, memorable lyrics and special creative touches make each song unique to the hero. My students are mesmerized by their stories and the songs. You can hear them singing in the school hallways! Our favorite is "Can't Stop Running", but we enjoy them all. I highly recommend this CD as an inspriational and fun way to educate your children and students! My fifth graders have been waiting for Jonathan's new "American Heroes #3" album for several weeks now and they were NOT DISAPPOINTED. I have been teaching for ten years and Jonathan's songs completely energize and captivate my students every year. His music not only entertains, but TEACHES you about REAL HEROES! Countless parents have told me his CD's have worn out their car stereos. Catchy tunes and educational lyrics...for all ages. Way to go Jon! Another "instant classic!" Once again, Jonathan has created awesome songs about REAL heroes and their achievements. His mastery of what they did and their heroic qualities capture the human essence of these incredible men and women. Kids and adults will not only learn about these heroes; they will find themselves singing along! Bravo. Jonathan Sprout has done an awesome job with this album! As an elementary school music teacher, I taught several of the songs to my students. The refrains are singable and memorable. My students have fallen in love with the songs. I frequently hear my students in the hallway humming or singing the Jonathan Sprout songs! They entice students to learn about the real life heroes featured in the cd....Their favorites include "Can't Stop Running" (Wilma Rudolph) and "Doctor" (Elizabeth Blackwell). These songs have a wonderful message and inspire students to reach for their dreams! My favorite song on the album is "Come Back Home." From a musical standpoint, the background vocals compliment the melody beautifully. You will be extremely happy with the purchase of this album. "This is actually the third album in a series by the wonderful and award-winning talented singer/songwriter Jonathan Sprout. The American Heroes Series is a collection of original songs that teach children about some of America's greatest citizens. This is a must have for teachers--and I will be giving one to my son's Kindergarten teacher when he starts this Fall! It is simply awesome. And I say this not just because of the fun upbeat music that gets toes tapping and hands clapping, nor because of Jonathan's wonderful singing, all but for another reason. We first listened to the cd with my two year old. And both boys together listening to fun lively music tends to result in lots of laughing, clapping and dance moves that would make Michael Jackson jealous (just saying....). But I really wanted my older son to listen to the words in the songs and the stories being told. So when my two year old went down for a nap, I put the music back on, and called my son to join me. Now he and I do reading, coloring, counting and all the normal kinds of educational activities parents do with preschoolers, but I never really discuss history with him. This is why I not only love this album, but am so grateful it arrived in our mailbox for a review! We sat on that couch together and talked about the different 'heroes' that Sprout sings about. How some overcame great challenges to be successful, and how nice it is to want to help others. Learning through music is perfect for kids, and I loved how my 4 year old responded to the songs. But I can also imagine this album being perfect for elementary school children of all ages. The "heroes" on this collection are Jane Adams, Elizabeth Blackwell, George Washington Carver, Cesar Chavez, Milton Hershey, Thomas Jefferson, John Muir, Pocahontas, Wilma Rudolph and Jonas Salk. I admit I needed some brushing up on my history as well-- and learned a few things myself listening to the songs! My son was fascinated of course with Milton Hershey 0r as he is known in the song, "Chocolate King." He was also very interested in "Peanut Man," better known to us as George Washington Carver. I was struck by the story of Wilma Rudolph, beautifully told in the song, "Can't Stop Running," which I hadn't known before. I could go on and on about this album, but it may be better for you to check it out yourself! You can listen to some clips and get an idea of what I'm raving about, and you can buy "American Heroes 3" (or any of the American Heroes collection ) at Amazon." Music has always been a favorite in our household. We enjoy a different variety of music, from country, to classic, to even a little bit of rock and roll. Our favorites are usually country and oldies, but we are always open to different tunes. My husband and I travel a lot and to occupy our time, we listen to music. We occasionally get sick of the radio, especially going through mountains and losing signal, so we try to stick to CD’s. I had the opportunity to review three CD’s during our recent travel to Tennessee. It was a four hour drive there and back, so we definitely needed some entertainment, besides talking. The CD’s we listened to are great for children and perfect stocking stuffers for Christmas. >American Heroes #3 is part of the American Heroes collection. The American Heroes #3 CD is written and sung by Jonathan Sprout. The CD has 12 songs and the songs are educational, upbeat, and very information. The songs being sung are about America’s greatest citizens. I was able to listen to stories about people who did wonderful things, such as the founder of Hershey Chocolate. Although the stories do not tell you their complete history, it does give you a glimpse into their lives. Each song is a story about a different person. The songs are easy to sing along with, the beat/rhythm gets you moving, and a wonderful tool for learning. You can really tell that Jonathan put forth the effort, the hard work and dedication, to provide a fun, educational learning system for children. I would recommend this CD in schools, as teachers can play it for their students. The age group I would recommend it for is 2nd to 5th grade students. "This CD is the third in a series by Jonathan Sprout in which he delves into American history to find remarkable heroes from our past. Writing songs about true-life stories, Jonathan transforms a children’s CD into something that is both fun and educational. And this history lesson is for the grown ups, too! Have you heard of John Muir (known as “the father of our national parks”), or ever wondered who was the first woman doctor in America? The stories behind these lives are rich and exceptional—what a wonderful gift to share with your family! Jonathan’s music is fun, too. From folk to classic rock, these songs cross genres and will appeal to both kids and adults. Our favorite songs on the album are Doctor , about Elizabeth Blackwell, the first woman doctor in America, and Peanut Man , about George Washington Carver, the famous scientist who developed over 300 products made from peanuts." "Both my 13 year old and 2 year old enjoyed listening to the American Heroes #3 CD, but I feel that my 13 year old really understood what it was all about. My two year old just enjoys it for the music. American Heroes #3 covers musical styles from Folk to Rock and everything in between. American Heroes #3 inspires children with not only the endeavors that brought these individuals to prominence but the personality traits that made their successes possible. Although Jonathan Sprout's carefully researched biographical anecdotes and historical facts are geared primarily for the enjoyment of elementary and middle school students and their families, the stories of these remarkable lives are an inspiration to all ages. At a time when Americans are looking for hope and inspiration, Jonathan Sprout reminds us that the keys to future success can be found in motivating stories of the past ... (a) wonderful CD." "An entertaining cd for the little ones PLUS a history lesson! "This album is aimed at teaching elementary and middle school students and their families that the “keys to future success can be found in motivating stories of the past.” The album offers up fun upbeat songs about some of our finest historical figures, including Thomas Jefferson, John Muir, Pocahontas, Jane Addams and more. It is music and a history lesson all rolled in one! This CD has quickly become one of my son’s favorites." "My daughter is in the preschool stages of learning, so to her this is just another fun music CD. To mommy, it's so much more. I can fully appreciate the value of learning that accompanies these fun songs and know that while she is having fun listening to a song while we are running errands in the car around town she is secretly learning. Remember how when you were a kid you seemed to learn things better if they had a rhythm or were in a song? Well, that's what Jonathan Sprout has done with these historical figures. He has told their story in a beautifully rhythmic song. The lyrics are catchy, the tunes are easy and you find yourself singing along. I think even grown-ups will find themselves either remembering something they had forgotten or learning a totally new fact. Jonathan Sprout has been making children's music for a lot of years and it shows. I love the fact that his music doesn't seem like he's trying too hard... if that makes sense, it just seems to comes natural to him. It's not goofy or cheesy like some kids music. He's not trying to be cool, he's just trying to make really great music that our kids will listen to and learn from. This album actually sorta reminds me of some of the School House Rocks songs... remember those from when you were a kid? I still remember words to the ones about not drowning your food and about being about being a bill on Capital Hill... just to name a few. It's the same concept behind his songs,teaching through music. The American Heroes series have received wide acclaim and multiple awards and for good reason. I love the fact that it's educational and my child will learn from it and it will grow with her as she matures, but also that it's music she will listen to and mommy and daddy won't be sick of after hearing it a gazillion times. We definitely think that this CD is a both a fun and educational and would highly suggest it. We plan on packing it in the car for our family vacation next week! You can listen to some samples of the songs off this album on his website JonSprout.com (along with the others in the series)"
"In his American Heroes series, Jonathan Sprout’s concept is simple: Write rock-and-roll-oriented songs around short, biographical narratives of great Americans. In the third installment of his series, American Heroes #3, Sprout highlights many Americans who may have been overshadowed as time moves on. Opener "Chocolate King" gets to the heart of Milton Hershey, "He Will Not Give Up" tells the story of Jonas Salk and his quest to find a vaccine for polio, and "Can’t Stop Running" relates the feat of Wilma Rudolph’s running on a twisted ankle to become the first U.S. female athlete to win three gold medals in track and field at the Olympics. Sprout’s passion for history is clearly showcased here through his voice, and he conveys important lessons in a way that's both accessible and fun for kids."